The wolf spider is a very large spider measuring at typically 1.38 inches. Wolf spiders are typically hairy with a brown color to them and have black stripes that run down their legs. Some are also known to be grey. They have two eyes on the side, two eyes in the front, and four smaller eyes. Males are typically darker than females. Wolf spiders also live in every part of the world. After mating the male is typically consumed by the female. The female then finds a isolated location to lay her eggs. She carries the eggs on her back unlike most spiders. Then she'll rip the eggs open to release her babies. The spiderlings will then hang onto their mother for a couple weeks then leave to fend for themselves. Wolf spiders communicate with visual, touch, and smell. 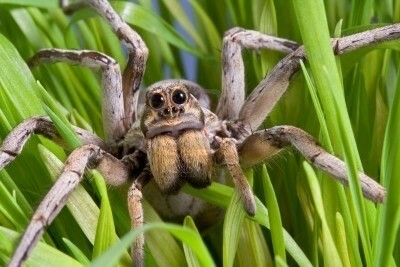 The purring beat a wolf spider makes can be heard from 20 feet away, but only last for half a second. Most spiders rub their feet to make a sound and communicate. Wolf spiders typically eat large insects, other arachnids, and even sometimes amphibians. If the wolf spider is really hungry it'll eat animals bigger than itself. As soon as the spider pounces on it's prey it'll inject venom.